The combination of fresh seafood and lowcountry cuisine has earned Murrells Inlet the title as the “Seafood Capital of South Carolina”, along with it's historical background as a fishing village. Area restaurant owners and chefs are known for buying their fare right off the fishing boats. Local specialties include renowned She-Crab soup, hush puppies, shrimp and grits and oysters. The Inlet Sports Lodge is also proud to announce it's newest addition - the opening of COSTA Coastal Kitchen and Bar located on property, serving fine, fresh Italian and Seafood fare. 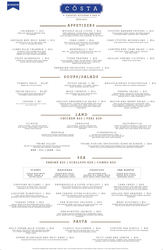 Menus are provided below, and may be clicked to enlarge and view. Scroll down to view a selection of pictures and descriptions of just a handful of our other area dining recommendations. 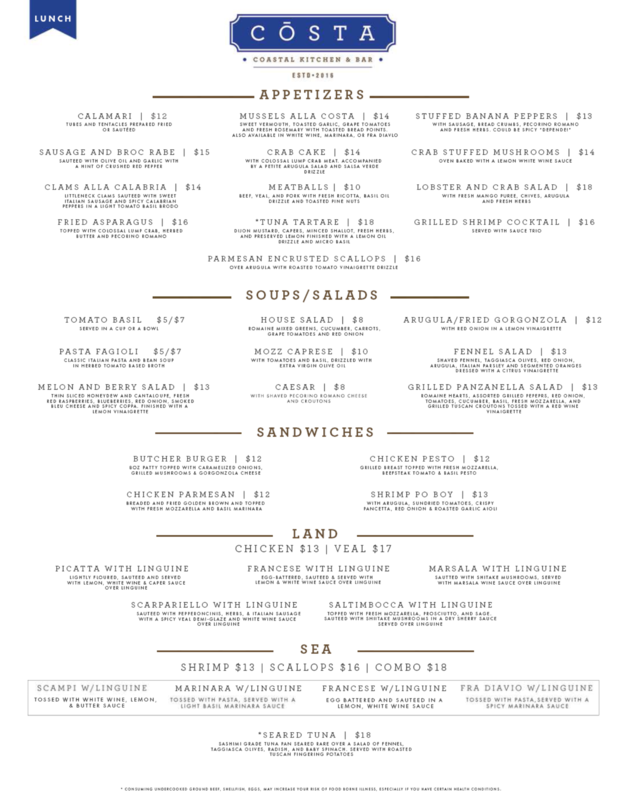 COSTA Coastal Kitchen & Bar Menues - Lunch & Dinner. Click to Enlarge. For a great value and a chance to have a sampling of a few restaurants along the Marshwalk and taste some of the best of what is offered, be sure to check-out Carolina Food & Walking Tours! Our brand new on-site restaurant C?STA (July 2016) offers a selection of Fine, Fresh Italian and Seafood fare. They are open for lunch and dinner through 10pm, as well available to offer room service. Enjoy a cocktail outside by the fireplace overlooking the pool and shaded oaks of the Inlet Sports Lodge or sit at the bar and choose from the area's widest assortment of fine international wines and specialty drinks. Enjoy ambient and intimate dining with menu options ranging from chicken and veal in all your classic stylings to bone in ribeye or prime filet and shrimp and scallops in scampi marinara or fra diavalo just to name a few. Call for reservations 843.299.1970. Dead Dog Saloon features a variety of items from Seafood, to burgers and plenty of options for kids. Enjoy their large covered patio which features live entertainment almost nightly as well as a large indoor open seating area, or sit on their outdoor deck and enjoy the view and breezes of the Inlet & Marina. Drunken Jack’s offers fresh seafood right off the boat prepared to perfection- grilled, blackened, sautéed, or southern fried. They also feature steaks, prime rib and chicken, and are famous Hush Puppies with Honey Butter! Enjoy waterfront deck seating as well. Creek Ratz offers a view of the Inlet, a full raw bar, fresh seafood, sandwhiches, salads, appetizers, pizza, children’s menu and kids area, daily happy hour, live entertainment, and TVs for watching sporting events. Nance’s are known for their year round local oysters (in season) and a variety of seafood, fish, chicken, and steaks in a comfortable atmosphere with stunning inlet views. This award winning eatery is situated along the Wahoo’s Marina, offering choice wood-fired steaks, fresh local seafood, wood oven pizzas and an extraordinary selection of unique dishes and a fresh salad bar. A true home-cooked Southern Buffet. Prosser’s is a unique signature of a Southern Barbeque Restaurant. 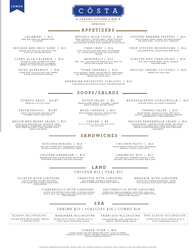 Fried chicken, collard greens, peach cobbler, pulled pork are all menu items that guests enjoy. For steak and seafood on waterfront dining, be sure to try the Hot Fish Club. The original “Hot and Hot Fish Club” was probably the first dining establishment in Murrells Inlet. The traditions established by the club are still alive within sight of the original clubhouse. The separate gazebo hosts frequent live bands playing reggae and other covers that bring in a fun crowd for nightlife entertainment, and dancing. Russell’s Is located on the Southern-most portion of the Murrells Inlet and features fresh seafood cuisine ranging from oyster stew, crab cakes, deviled crab baskets, scallop, shrimp or oyster platters, flounder and more. Also, enjoy steaks, daily specials, and a full bar, except frozen drinks. Recently awarded by Southern Living Magazine, Lee’s Inlet Kitchen has been a local favorite, family owned restaurant since 1948. Many of the recipes used such as Shrimp Salad and Creole, Tartar and Cocktail Sauces, Corndodgers and famous onion rings have been handed down through several generations. Adjacent to the Divine Fish House, Wahoo’s features an open-air tiki bar with beautiful waterfalls and is known for its frozen liberations, ice-cold beer and lively nightlife. Feast on fresh seafood creative appetizers, as well as other delicious items featured on the award winning Divine Fish House menu. The Inlet Crab House is locally owned and operated by the Mayes family, established in 1992. They offer a taste of the Islands of the Inlet, and are a local’s favorite with great prices for a variety of your favorite seafood platters including shrimp & grits, blue crab, soft shell crab, sea scallops, clams, oysters, scallops, grouper and more. With superb waterfront views of Murrells Inlet, this Taste of the Tidelands award winning restaurant features the freshest seafood aged steaks, nightly chef specials, and a sushi bar. Treat yourself to superior service, superb seafood, sushi, and spirits in the main dining room, picturesque bar or spacious outside deck, all of which overlook a marina and the beautiful waters of Murrells Inlet. Planning a trip on a whim? Save money with our last minute deals. Receive special offers & discounts from us.